Do you think that your home may be having an electrical issue? Perhaps you have flickering lights, frequent breaker trips, or sparking outlets. If any of these issues are occurring, it may be time to call a professional electrician. What should you do when your home is showing symptoms of an electrical problem? You should call Blue Collar Electricians to set up a service call today. During the service call, an electrician will come to your home, review the symptoms, and determine the root of the electrical problem. Once your electrical problem is determined, a solution to the problem will be provided and can be repaired upon your approval. When you suspect that you may be having an electrical issue, it is important to call an electrician quickly. While some issues may not require immediate action, others can be dangerous and even cause a house fire. • You smell an odor similar to burning plastic. • Your outlets are hot when you touch them. • Your GCFI outlets are not working properly. • Your outlets are sparking. • You can see damage to your wiring (frays, splits, breaks, etc.). • You have aluminum wiring. • Your lights are flickering or dimming. • You hear your lights buzzing. • Your breakers trip frequently. For more detail on each of these signs and what to look out for, read our blog 9 Signs of an Electrical Issue. Though some of the signs and symptoms outlined are more dangerous than others, it’s best to consult an expert electrician immediately. Your home is an important investment and where you make family memories. Call Blue Collar Electricians to determine how to protect your investment and keep your family safe. Is It Time to Call an Electrician? 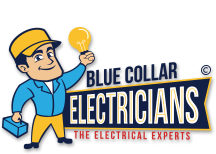 Contact the experts at Blue Collar Electricians today.